Our range of products include Electric Wire Rope Hoist such as Heavy Duty Wire Rope Hoist and Electric Rope Hoist. We are majorly looking for local queries. We are one of the renowned names of the industry engaged in offering a high quality range of Hoists to the esteemed customers. Our range is strictly manufactured under the strict supervision of expert professionals by employing modern machinery, genuine tools and high-grade raw material. These hoists are built to stay on the job even under the toughest working conditions. 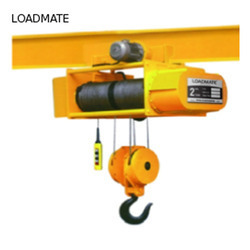 'Loadmate' Hoists are well known for their salient features like greater flexibility, high efficiency and longer functional life. The offered hoists are also tested on various parameters so as to ensure their adherence with international quality norms & standards. Owing to our contemporary manufacturing facilities, we are able to offer a broad array of Electric Hoists. These Electric Hoists are used for material handling and are best suited for both medium and heavy duty operations. The Electric Hoists offered by us, are easy to maintain as these are constructed in open type. In this type of construction, every component can be accessed with ease and provide hassle free operations. These Electric Hoists provide reliable performance and are rugged in built. We are a competent manufacturer, supplier and exporter of Baby Hoist. The sophisticated range of Baby Hoist, extensively used in different heavy industrial units, is acknowledged for their high tensile strength and greater longevity. 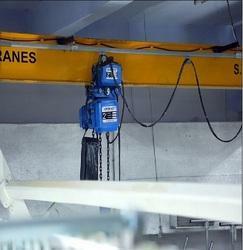 Anti corrosive powder coated finish and in-built control panel make our Baby Hoist widely accepted in the market. Our quality conscious approach, well-organized distribution system along with timely delivery has enabled to us garner vast clientele across India. We always show our equal and consistent commitment to the products and processes. Banking on our industrious professionals we are presenting an excellent array of Compact Wire Rope Hoist to our clients. It has excellent shock resistant capability and also is resistant to vibration. This product is made as per the industry standards by our leading industry experts with use of cutting edge technology. We are providing our range of Compact Wire Rope Hoist in latest technical specifications and perform complete inspection to ensure that our range is fully flawless and able to cater to the clients demands. 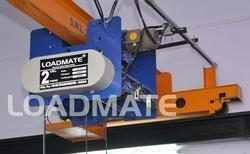 LOADMATE Crane Hoist are suitable for Medium/ Heavy duty operation and are designed in accorndace with IS:3938. 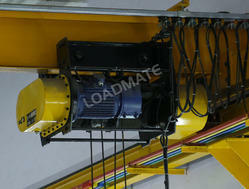 Crane Hoist are designed in modular construction with each component easily accessible for maintenance. The Rope drum, Gear Box, Motor, Brake and panel can be easily attended to, the frame is of study design fabricated from steel plates & is welded/ bolted type. Wire rope as per Is:2266 with minimum factor of safety of 6 is provided. Push Buttons operating on low voltage of 110 volt to ensure safety of the operator. Rope Drum : Steel Fabricated/ Seamless Pipe Drum is machine grooved to IS-3938 and is designed to the whole length of Wire Rope in one layer. Wire Rope : 6 X 37 construction Steel/ fibre core Wire rope as per Is:2266 with minimum factor of safety of 6 is provided. Gear Box : Complete gear train for hoisting motion is in an enclosed cashing provided with oil bath lubrication. The gear are made from alloy steel. Lifting Hook (IS-3815) : Forged steel Shank Type hook with Trust Bearing for swivel is incorporated. Trolley : Runner Wheel can be factor adjusted for various size I-Beams, trolley, Motor driven, Hand chain driven or pull push type can be provided as per requirements. Motor : Motor are of Squirrel Cage, 40% CDF rating in class B insulation as per IS-325-1970 manufactured by NGEF/ Bharat BIJLEE/ GEC/ CROMTON/ own make. Hoist Brake : The Hoist Motor is fitted with in electromagnetic brake of Shoe/Disc type. The brake is selected for 150% of load torque to ensure safe holding of load, Make 'BCH'/EMCO/ UNITORC. Limit Switch : Snap action type limit switches are provided to avoid over hoisting and over lowering. Control : The hoist is controlled from ground level by means of pendent type Push Buttons operating on low voltage of 110 volt to ensure safety of the operator. Control panel is of enclosed type, easily removable cover complete with Transformer Contactors and Fuses. 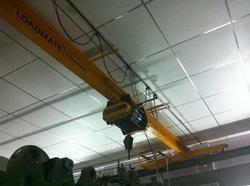 Banking on our industrious professionals we are presenting an excellent array of Overhead Hoist to our clients. It has excellent shock resistant capability and also is resistant to vibration. This product is made as per the industry standards by our leading industry experts with use of cutting edge technology. We are providing our range of Overhead Hoist in latest technical specifications and perform complete inspection to ensure that our range is fully flawless and able to cater to the clients demands. Electric Wire Rope Hoist are designed in modular construction which greatly simplifies repairs & cuts down - time. The special features are low head - room, spur / helical gears running on antifriction ball bearings with oil bath lubrication, motors confirming to IS 325, " fail to safe " breaks which automatically operate in case of any power failure, tested wire rope confirming to IS 2266, forged hooks conforming to IS 3815 and push button stations operating at step down voltage of 110 V or 24 V. The Electric Wire Rope Hoist gear train is with precision hob cut helical / spur gears having hardness up to 250 to 300 BHN running on bearings housed in sheet metal cover with gasket & lubricated with oil bath lubrication. The rope drum is made from M.S. Seamless pipe having machined cut spiral grooves & mounted on self aligning bearings. Rope guide will be provided for perfect sitting of rope in drum grooves. Electro magnetic FAIL to SAFE type brake is provided on hoisting motion which ensures perfect safety even in case of power failure. Limit switches are provided on hoisting & over lowering. 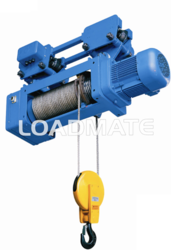 To accommodate specific requirements, LOADMATE Electric Wire Rope Hoist can also be built with micro speed arrangements (10% of normal hoisting speed), flexible trolleys to negotiate small radius, high speeds & high lifts, hoists suitable for steel mill duty; foundries & Chemical Plants. We are noted manufacturer of a wide range of premium quality Rope Hoist. 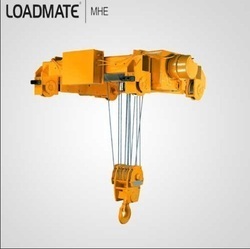 'Loadmate' Electrical Hoists is 100% safe and provided with electrochemical conical disc type break which makes them the most exclusive Electrical Hoists available in the marketplace. Our Electrical Hoists is widely appreciated for heavy loading capacity, safety, noiselessness, trouble free performance and low maintenance. In order to ensure quality of these products our team of experts examines the entire array on various parameters. We also designed our Electrical Hoists in order to meet specific requirements of our clients. We manufacture high quality Flame Proof Hoist from reputed professionals who use advanced production techniques in designing these. The electrical components that we use in these hoists are stamped and certified by central mining research station, dhanbad. Our hoists are available with flame - proof electricals confirming standard patterns flameproof electricals are certified 'Loadmate' Flame Proof Hoist range is incorporated with flame proof motors, limit switches, brakes and push button stations for improved efficiency. Our Flame Proof Hoist is widely used in various industry. The prices offered by us are best in the entire industry. Our organization is an eminent name in providing Heavy Duty Wire Rope Hoist to our clients. It is able to withstand working load conditions of the slings and is provided in various specifications to our customers. It is made available in large gamut of dimensions, textures and other similar options to our customers. Experts have used best grade raw material such as stainless steel and others to produce the complete range in adherence to the set industry standards. It is available at market leading rates to our clients and we assure time bound delivery. The expertise of our organization lies in offering an excellent array of Industrial Rope Hoist to our clients. It is best for load lifting and heavy material lifting in industrial applications. It has an excellent and improved capacity and is manufactured with use of latest technology. Industrial Rope Hoist is considered to be an important product in your assembly workshop or industrial plant. It is easy to use and operate and is available in wide ranging capacities as well. Furthermore, we are providing this at convenient rates to fulfill the expectations. We are engaged in offering a very high quality range of Rope Electric Hoist. To keep pace with current market conditions and owing to our goal we are engaged in manufacturing and delivering high grade Single Girder Hoist. 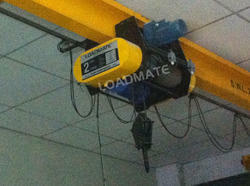 Like all other 'Loadmate' products our Single Girder Hoist are also economical, simple, safe to use, rough and adaptable. Our range of Hoists is manufactured through quality raw material and experienced technicians that are acknowledged for optimum quality and high functionality. Our range of Hoists is tested at every stage of development to ensure for higher performance, longer working life and cost effectiveness. We also manufacture and modify our range of products as per requirements and demands of clients. The Wire hoist offer a special fail safe brake design that acts on the first stage of the gearbox shaft. This ensures brake operation, even if the motor is removed. Our Wire hoist also have a true vertical lift without horizontal hook drift throughout the hoisting. 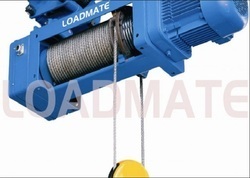 'Loadmate' Wire Rope Hoists are manufactured and offered using high grade materials according to industrial standards. Our range of Hoist is one of the most exclusive hoists available in the market which are 100% safe and easy to operate than other Wire Rope Hoists. We have developed a wide array of range from 0.5 to 30 tons. These Wire Rope Hoists are known for high load bearing capacity, smooth-trouble free working and longer working life. LOADMATE offers standardized HD Electric Wire Rope Hoists. With reputation for quality, reliability and affordability, Loadmate Electric Wire Rope Hoists feature several advanced engineering concepts with special emphasis on safety and versatility. Loadmate Electric Wire Rope Hoists are compact with low headroom dimensions and incorporate latest technical innovations. These hoists are produced using the most advanced technology available and continue to witness reliability, safety and durability year-after-year, from motor to rope, gearbox, brake and electronic systems. These units cover an extremely wide SWL range from o.5 MT to 100MT in both monorail and double girder configuration. The Hoist Wire offer a special fail safe brake design that acts on the first stage of the gearbox shaft. This ensures brake operation, even if the motor is removed. 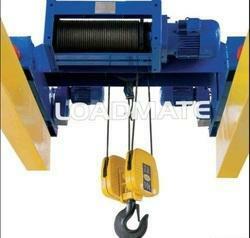 Our Hoist Wire also have a true vertical lift without horizontal hook drift throughout the hoisting. Our aim is to satisfy precious clients so we are manufacturing and delivering a premium quality Industrial Hoist including Electric Wire Rope Hoist and Wire Rope Hoist. 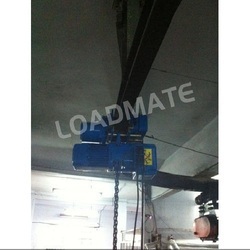 'Loadmate' Industrial Hoist are nationally appreciated for noiselessness, trouble free performance, less maintenance and compact designs. 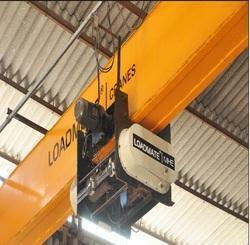 We also offer wide array of hoist ranging from 0.5 to 30 ton. Our clients can avail these products at very economical prices and as per their requirements. We also customize these hoist to satisfy them at best. 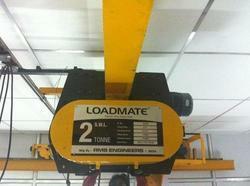 Loadmate Industrial Hoist are indispensable in your assembly workshop or industrial plant. 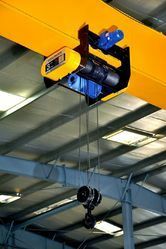 With the latest technology for improved load accuracy, versatility, and ease of use, the Industrial Hoist is the industry leader in medium-heavy indoor cranes. Wherever and however you need it, the Industrial Hoist provide you with an excellent modern lifting solution. Hugely demanded in medium and heavy duty industrial operations. 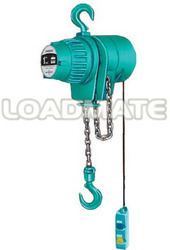 Our Mini Electric Wire Rope Hoist used in lifting and lowering large loads through a lift wheel or drum that is wrapped around by chain or rope. Made of Steel and/or fiber core these Electric Wire Ropes are in tandem with accepted industrial standards.